My love for Salmon has no limits and making a fish curry out of Salmon is total bliss. 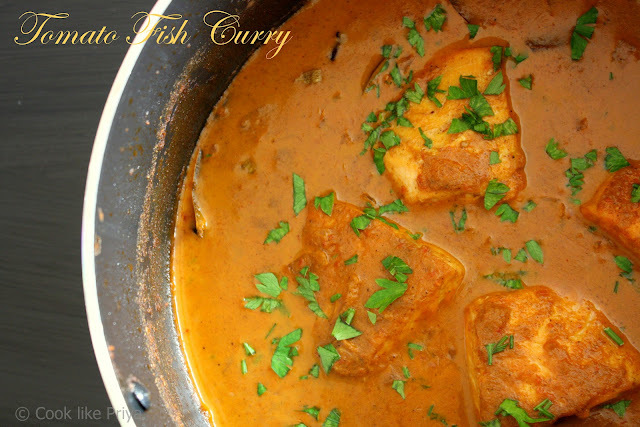 I always believe that it requires a bit of slow cook for a rich and aromatic fish curry. This one is no exception as it is packed with lovely flavors and is a tomato dominated fish curry with no coconut. Its great for mid-week meals and can be combined with rice, dosa, idly or even any flat indian breads. Rub the fish with turmeric and salt set aside. Take a large pan/skillet heat oil, add the whole spices and let it sizzle for 10 seconds. Now add the onions and let it fry until golden brown, should take 2 minutes. In the mean time grind the ingredients mentioned under grinding using a mixie with a little water. Once the onions are golden brown add the paste and let it cook in a medium to high flame for 5-7 minutes until all the water is evaporated and cook for another 3 minutes in high flame, to brown the curry a little further. This releases oil and full flavor. Now add 1 cup water and bring to a boil, reduce the heat to medium and let it cook for 5 minutes. In a tawa/ skillet add oil and fry the fish for 2 minutes on each side until golden brown. Use a lid to cover the fish for it to cook even from the inside. Flip over and cook all sides, be careful not to break it. Now taste the curry to check for salt and spice, add 3 tbsp milk and garam masala. To this add the fried fish and excess oil in the tawa, do not stir too much and close the lid. Let it cook for 4 for minutes until thicken. Serve hot with rice, dosa or roti. -original recipe calls for adding creme (double), i have used milk yet the curry tasted yum. I soo wish I could get salmon easily in India. 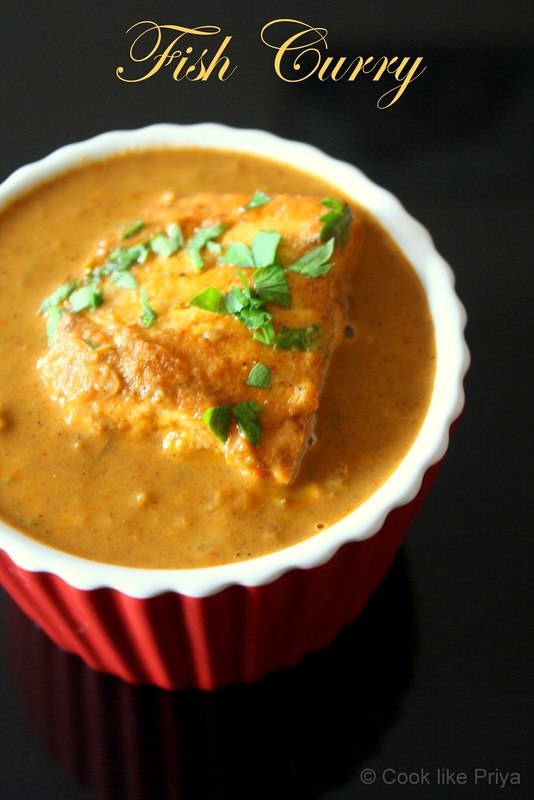 the fish curry is just too tempting! I love Salmon too. This curry looks yummy and flavorful..
Yumm, fingerlicking fish curry,loving this irresistible curry. 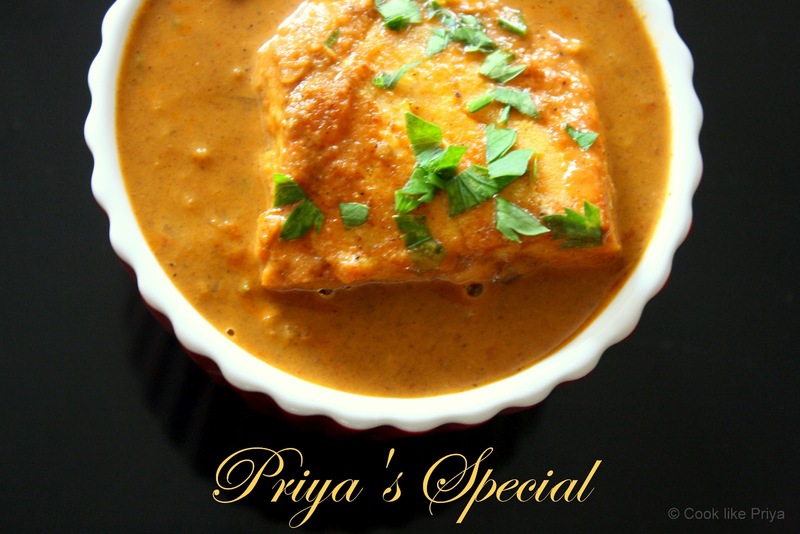 Delicious fish curry Priya. Lovely recipe. Yummy looking fish curry dear...Nice clicks..Love the 3rd pic more.. Guess what I was looking for this recipe....bookmarked...awesome clicks dear. lovely fish curry! awesome clicks Priya! Oh my goodness my mouth is watering!!! I am a salmon freak. Looks absolutely delicious!!! 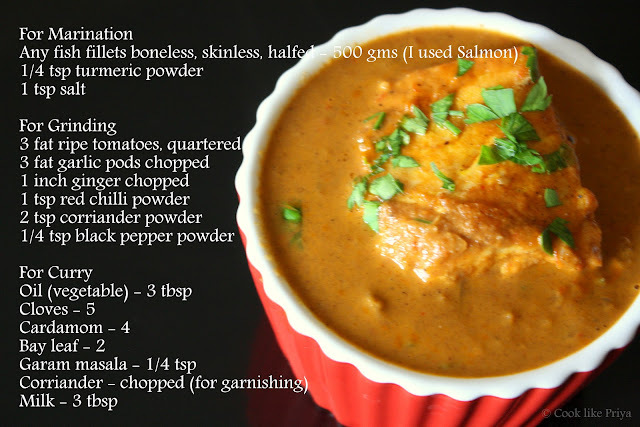 We are planning a fish curry for New Years Eve and I think the spices in this one seems wonderful combined with fish. Is it possible to add coconut milk to this instead of creme? Thanks! Thanks for this delicious and quick recipe. My husbands loves this curry like anything. Please suggest, can we add coconut oil in the end of the recipe, to give the southern touch. Thanks for sharing this - my wife and I loved it ! !